[NA]♦5th Northumberland Fusiliers♦[NA] CLOSE to 1 YEAR! Whilst in the Peninsula the regiment earned the nicknames the " Old and Bold," " The Fighting Fifth," and also " Lord Wellington's Bodyguard." Maximum amount of people in each rank! Want to talk to the CO's? The regiment was originally part of the Dutch service and known as the Irish Regiment, or Viscount Clare's Regiment, under the command of Daniel O'Brien, 3rd Viscount Clare. In the following year the colonelcy passed to John Fenwick and the "Irish" designation was discontinued and the regiment was referred to as a "Holland Regiment". The regiment was transferred to the British Service on 5 June 1685, establishing its order of precedence as the 5th Regiment of the Line. Until 1751, like most other regiments, it was known successively by the names of the colonels who commanded them at the time. The 5th left Monkstown[disambiguation needed], Ireland on 7 May 1774, for Boston, Massachusetts Bay Colony. Their presence was necessary because of strong civil unrest in the area. Arriving in July, 1774 the 5th camped on Boston Common. After spending two months on board ship in Halifax, Nova Scotia, the 5th sailed to New York to participate in the effort to capture the city from the Americans. They took part in the Battle of Long Island and the Battle of White Plains, the capture of Fort Washington, New York, the capture of Fort Lee, New Jersey. They then spent the winter of 1776-1777 quartered near New York City and were involved in skirmishes with the American forces. They were then part of Howe's campaign to capture Philadelphia, being engaged in the Battle of Brandywine Creek, where they broke the Continental Army's center at Chadds Ford, capturing 5 cannon. On the retreat through New Jersey, on 28 June 1778, the regiment was involved in the fighting at Monmouth Court House. While in New York, the 5th participated in several raids and skirmishes, including a raid on Little Egg Harbor, New Jersey. The Americans had been using the harbour for privateering, and this raid succeeded in destroying many buildings and boats. They then embarked from New York on 3 November 1778, for the French West Indies, landing on 13 December 1778, on the island of Saint Lucia. The 5th was engaged with a small force of French and captured a four cannon battery. On 18 December 1778, a force of 9,000 French troops were landed on St. Lucia. The small British force of 1,400 men occupied a hill located on the neck of a peninsula. The French were fairly raw soldiers trained to fight in the classic European style of linear battles. The French advanced on the British force several times. The British, veterans of colonial fighting, inflicted a stinging defeat on the French. The French lost 400 killed and 1100 wounded to the British losses of 10 killed and 130 wounded, which included two officers from the 5th Foot. As a result of the defeat, the French force abandoned the island. Regimental tradition states that after the battle men of the 5th Foot took white hat plumes from fallen French soldiers and placed them as trophies in their own hats. After two years in the West Indies, the 5th Foot was sent to Ireland in December 1780. They were still in Ireland when hostilities between Great Britain, France, Spain, the Netherlands, and the former Colonies officially ended in 1783. Sir Charles Broke [or Brooke, subsequently Vere) was in Lower Canada with his regiment, the 5th (Northumberland)Regiment of Foot, which was at the Battle of Plattsburg in 1814. Later he was with the Army of Occupation in France, receiving the Waterloo medal despite arrivin too latefor the battle (from Manasek). (from a note on A. Arrowsmith's map of North America in the David Rumsey Map Collection). 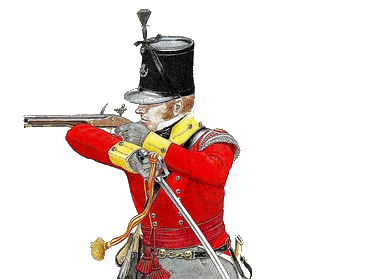 5th, or Northumberland, Regiment of Foot shall in future be equipped as a Fusilier Regiment, and be styled the 5th Regiment of Foot, or Northumberland Fusiliers. Under the Childers reforms of 1881, the numbered regiments of the line were given new titles, and were linked with a particular recruiting district, usually a county. At the same time the existing militia and rifle volunteer units of the district became battalions of the regiment. Colonel - Col - Regimental first in command. Lieutenant - Lt - 2nd in Command, Helps get people on, Recruit, Runs Events/Trainings. Colour Serjeant - CSjt - Regiments bester meleer. Regular - Rgl - have to be active, Skillful, and Disciplined in the Regiment. Also is noticeable getting better in all points in the game. Takes 2-3 weeks to get depending on how long it takes for you to require these skills. Most of the members stop at this rank, as many are hand picked for greatness. This regiment is souly to have fun. Add me on steam! and we'll talk from there. what days could you make events? Killing is our business;and business is good. Thanks to the 83rd for the thread template! 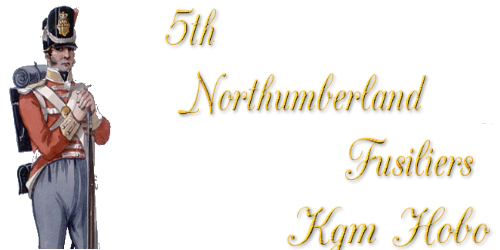 Re: 5th Northumberland Fusiliers "The Fighting Fifth"
3eVolt lasted long, ChanChan the Music Man. Good luck guys. Chan, come back in and I'll move you in. Alex, you're just jealous of me being FABULOUS! Who bumps? Kick it to the top.